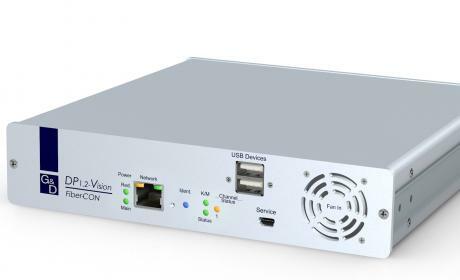 DP1.2-Vision uses fibre optics to transmit signals up to 10,000 m (Fiber). The devices use DisplayPort 1.2 video and are available as single and multi channel variant (in preparation). It is also possible to transmit transparent USB 2.0, RS232 and audio signals. The system consists of a computer module (transmitter) and a user module (receiver) and enables you to operate a computer on a local or remote console.